Every Tuesday morning, I travel to the delightful Sussex village of Ditchling for yoga class; I’m the only man among thirty delightful Ditchling ladies. At the end of class, another delightful group of Ditchling ladies takes over the space for a choir rehearsal. As part of this activity they make wonderful cakes, chutneys and jams, and sell these to one another to raise funds for the choir. I purchased a jar of this home made jam from a delightful choir lady at the produce table, and brought it home; it was the most delicious jam I had ever tasted. At the end of yoga class the following Tuesday I was keen to buy another jar, but found a different person selling the home-made produce. This one looked a lot like Kathy Bates in the movie Misery, not very delightful at all; and she told me in no uncertain terms that I couldn’t have the jam – it was strictly for choir members. “But it’s the most amazing jam I’ve ever tasted!” I enthused; this didn’t work – the answer was no. That’s how the trouble began. Each Tuesday thereafter, I watched the produce tables being set up. As soon as anyone other than Kathy Bates Woman was serving, I thought I could nip in, buy a pot of jam, and dash away. This worked for the next two weeks; I had now sampled three flavours of the jam, all of which were amazing. On the third attempt, however, disaster struck. Delightful Lady served me, but I hadn’t given the right money, so she asked the others if they had change. Kathy Bates Woman overheard. She wrenched the jam from my grasp, grabbed the money back from Delightful Lady, and slapped it down on the table. “I told you – this jam is only for the choir!” she hissed. From then on, she was watching out for me; I was only ever able to get one more pot of jam, five months later, when she was off ill; unfortunately she recovered quickly and was back, eagle-eyed and vindictive as ever. I had to get more of that jam. I found myself thinking about the jam a lot. In the class on Tuesdays I could never focus on the yoga, wondering if maybe this time Kathy Bates Woman wouldn’t appear and I would be able to get my hands on a precious pot. I also spent endless hours at home, wondering about the provenance of the jam. I became convinced that here was something strange going on, but I couldn’t get my head around it. How could anyone make such divine jam, but be such a horrible person? It defied the culinary laws of nature. I spent that year pondering this question. Maybe she doesn’t make the jam herself, I thought. Yes, that must be it! Perhaps she keeps a prisoner at home – another Delightful Lady whom she has some kind of hold over, who does nothing but make exquisite jam, and isn’t ever allowed to leave the house, kept prisoner just like James Caan in Misery. Kathy Bates Woman knows it’s the best jam in the world, and derives added sinister pleasure from knowing that she can grant or deny access to it. The situation was getting worse. I became totally obsessed with the jam, and couldn’t sleep a wink on Monday nights; I simply had to get more of this, the holy grail of jams; I had to win over this evil tyrant. But how? In the end, the solution came from an unexpected quarter. A year on from the acquisition of that first glorious pot of jam, my yoga teacher – a somewhat intuitive, mystical woman – approached me; she had picked up on my plight, and wanted to help. She pointed out that one of the members of our class also belonged to the choir – another very delightful lady. Why didn’t we speak to her? So we did. Delightful Lady #3, who happens to be a champion of human rights, was outraged that I should be prevented from savouring the most wonderful jam in the world. So suggested we set up a system. I would give the right money to Yoga Teacher, specifying which flavour jam I would like; she would meet with Delightful Lady #3 in the lady’s loo and pass the money to her. Delightful Lady #3 would purchase the jam, then re-visit the loo to pass it to Yoga Teacher, who would then hand it over to me, outside the venue. Hey presto! The system works a treat. Kathy Bates Woman knows something is wrong, but can’t work out what. Too much jam is disappearing. 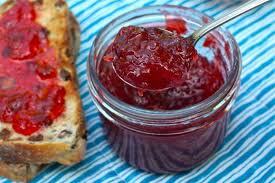 The jam tastes as good as ever, but visualising Kathy Bates Woman’s discomfiture makes it taste even better. I know it’s my duty to start an investigation, find out where she’s hiding the jam-making prisoner, Delightful Lady #2, and release her – but not just yet; the jam-making might stop. I do hope her legs are okay.